The August Full Sturgeon Moon. You have heard me say this before: "Don't get stuck in the High Tide mentality!" A very good example of this would have been this last week of tides, where we had very little overall height change between tides during the middle of the day, and slower incoming water, on the highest tides, into darkness toward the end of the week. Many people would not take seriously a mid day, broad daylight, high tide of 5 to 6 feet, losing only about one foot or less at low tide but a few hours later. They would have been looking at the later, major high tide for their opportunity. But what if that particular major high tide was scheduled for 10:52 p.m.?! On Thursday of this week that is just what happened. But for a few venturous souls it was a perfect set up for hours of opportunity. Of course it did help that we had overcast and cloudy, drizzling, autumn cold, foggy conditions for a day or two preceding this particular tide cycle. We had silver salmon and pink salmon rolling in front of us for hours, right through the mid day high tide, often just a few yards from the beach. We fished the earlier morning incoming tide for sea run Cutthroat too, very successfully I will add, and the mid day high tide for salmon. Predictably, once the tide topped out- at about 2 p.m.- like quitting time at the factory, almost everyone left the beach all at once. Except us. And we had fish in front of us for another two hours, even into the dropping tide. Then it got quiet. We took a break and had a late lunch. Then we hit another beach for the beginning of the next incoming tide just a few hours later. With no serious signs of working fish there, we jogged back to our earlier spot, on the theory that there was not enough overall tidal exchange that afternoon to change the pattern of returning fish in that vicinity. That they would likely get right back up on the shallow bars and flats again, as the evening tide began to move in. And that is exactly what happened. And so we had fish running on that beach again, in shallow water right in front of us, for several more hours into dusk. Later on, upon my guest announcing his "last cast", a big fish rolled right in front of him. So very Inspiring! . . . We quit when it was almost totally dark. Cool Beans. Sometimes it pays to leave your watch at home. There is a pulse to these things. A rhythm. You can't find that in a book, or a magazine article, nor in a blog. You have to spend your time on the water here. And each location has its nuances. 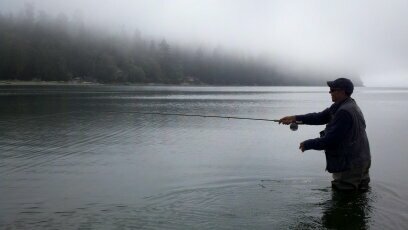 A misty morning sea run Coastal Cutthroat trout session. And to what do we owe this day of magic? The waxing Full Sturgeon Moon! And beginning tomorrow, Sunday August 18th, we will again be enjoying morning minus tides, and afternoon to evening extreme high tides. This is looking especially good around the 20th and 21st. In fact we have Wicked Good tidal times and conditions ahead for the rest of this month! 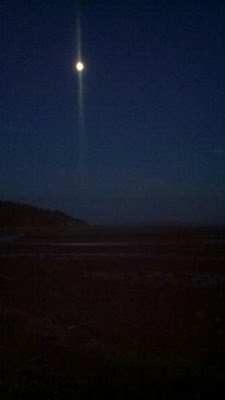 Many anglers would tell you to fish only around the period of a full moon, and only around high tide. They like the stronger currents and longer time period of flows. And in some places this is indeed an advantage. But some of these softer tidal days are not to be missed. Pay attention to the conditions! 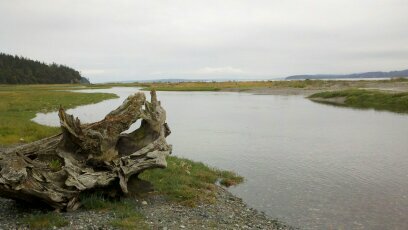 Low light, shallow water, incoming tide. One great thing about weaker tidal exchanges is that the forage fish and invertebrates etc., are less likely to be swept away in strong tidal flows. They can hang around in quieter back eddies and pools etc. And with enough water around between tides this can keep the predators- (like those big, fat sea run Cutthroat trout that we want to catch! )- hanging around to feed, or . . . Just hanging around. They do that you know. Nothing going on; just hanging around, under a dock, along a ledge or in a trench, in deep water, in shallow fast moving water, just sort of doing nothing. I have often seen these wild trout suspended, amid a school of chum fry, or herring, smelt, perch, absolutely not doing anything at all. Not feeding. Just snoozing. You might wake these malingerers up with a well placed soft hackle fly, like a Partridge and Orange. 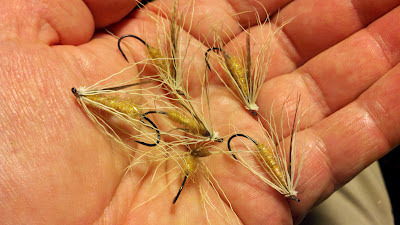 Or maybe you'll trick one up on the surface with a lightly skimming Muddler Minnow. The quieter the water the lighter I will present the fly, and sometimes the smaller the fly as well. Try a dry fly too. I notice that with this recent bit of moisture we have had here on the west side of the state, and the humidity increase of the last week, and now with the return of summer-like temperatures, the Termites are everywhere here again. Try a rusty colored # 6 Stimulator. Yes! In saltwater! The pressure was just too much for this man. 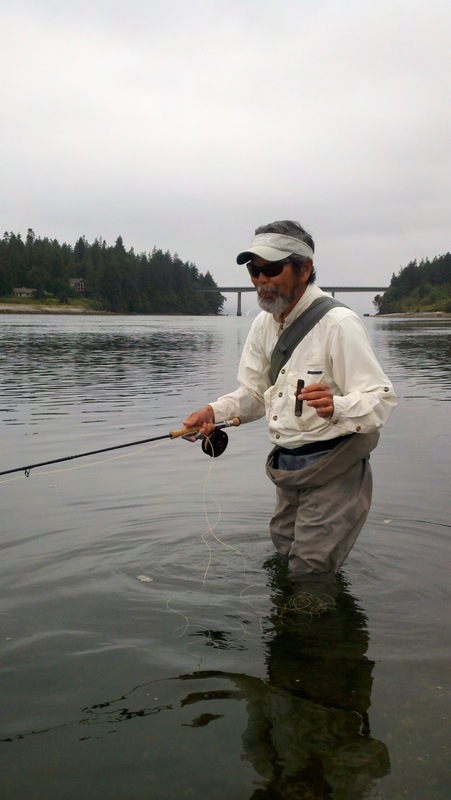 Your Olympic Peninsula fly fishing Guide, Catch & Release, Fly Fishing Only. 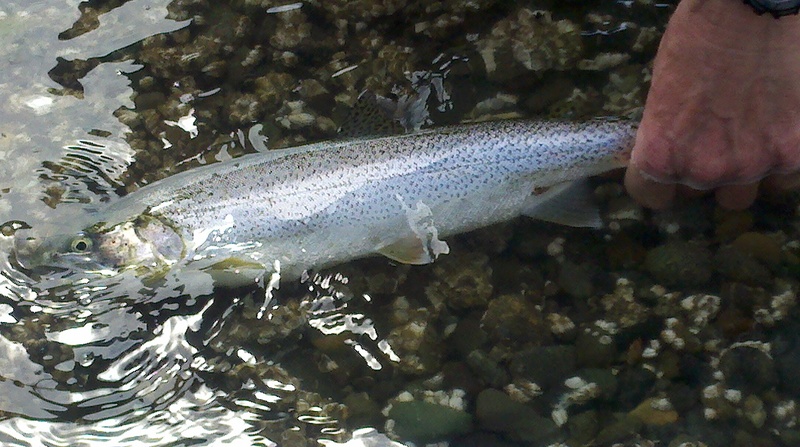 Releasing a wild sea run Coastal Cutthroat trout. 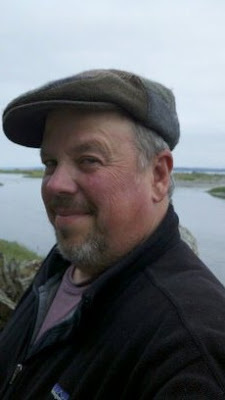 Here is a link to an interview I did last year. This is by Jan Halliday, of The Port Townsend Leader newspaper. This was a lot of fun. It turns out that Jan has had quite a remarkable Pacific Northwest fishing life of her own. And she is a very good writer as well. Check out her weekly column. Thank you Jan! So far it has been just another boring Pacific Northwest summer- You know, all the usual tedious stuff; day after day of beautiful blue skies and sunny warmth, soft cooling ocean breezes all day, glorious sunsets, refreshingly cool evenings and mornings, and a huge run of Coho and Pink salmon coming into Puget sound waters now. . . And we are catching some Wicked Good sea run Cutthroat out there too. Ho Hum. Only the strong survive. A very nice cooling trend settled in here over the last few days, and we even got some light rain and fog today all morning into mid day. 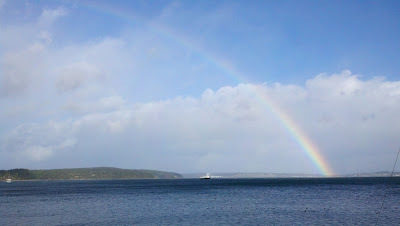 I'm thinking that this weekend is going to be just flat good for Cutthroat and Coho on the beaches. 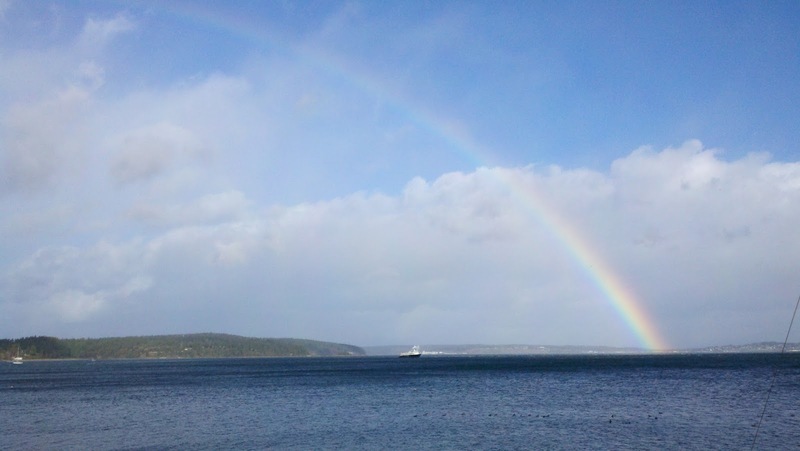 The long range forecast for Admiralty Inlet shows very stable weather; clear nights and mild days, very little wind. Unfortunately this little trickle of rain has not made a perceptible impact on the normally low mid-summer flows on our coastal rivers. MMM... Some really good evening tides coming up now around this new moon cycle. Don't miss the evening tides on our beaches! Now booking fly fishing trips on the Olympic Peninsula waters. Catch & Release, Fair Chase, Fly Fishing Only. 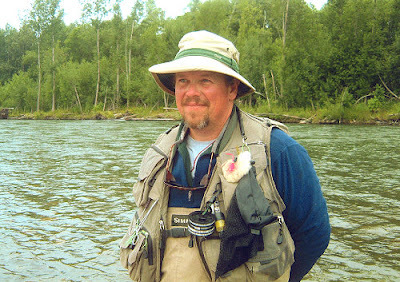 Celebrating over 30 years of fly fishing adventures! Please call or write for booking details. Beginners welcome, full instruction available.